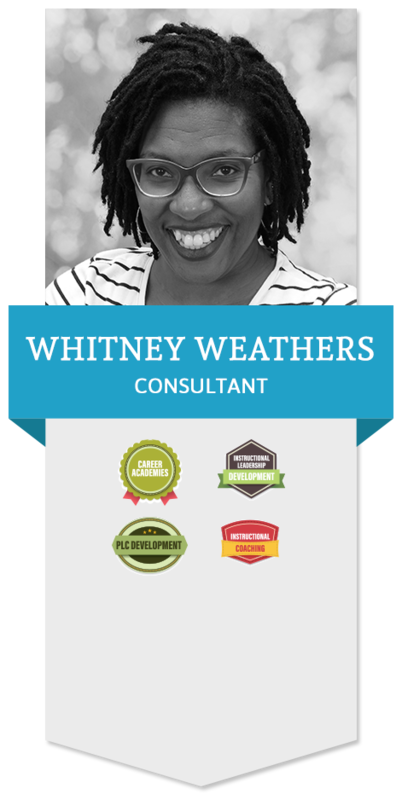 Whitney (Bradley) Weathers, is an Assistant Principal in the Denver Public Schools system. With just under ten years of experience as a teacher and teacher leader, she is passionate about teaching and learning as vehicles for change. She is a graduate of Nashville State Community College, Tennessee State University, and Vanderbilt University. She moved to Denver from Nashville, TN in 2016 after working in the Nashville Public School system. During her time in Nashville, she received numerous teaching awards and accolades, which include Teacher of the Year for the Metro Nashville Public School System (2015) as well as Regional Teacher of the Year for Middle Tennessee (2015).